An inn called the King's Head was originally on this site. 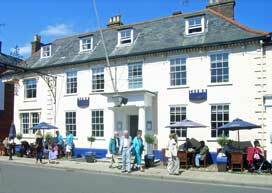 It was rebuilt in about 1740 and became known as the 'New Swan' until 1829 when, according to James Maggs, "Mr Hy Garrod alter'd it to the sign of the "Crown"'. Its Doric-style portico was probably added then. Grade II Listed, The Crown is considered one of the finest examples of Georgian architecture in the town. Mrs Francois - takes the "Crown" over on 16 January. She has come from Cromer. 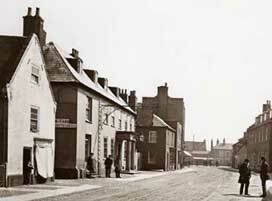 (M) Henry Garrod moves to Constitution Hill where he sets up a new Beer House called 'The Tom & Jerry'. Mrs Francois - leaves the "Crown". (M). This is essentially a repossession. Mrs Francois seems to have become insolvent and, according to Maggs, her lease is reaassigned to her creditors, Read Crisp and William Abbott. (More about Read Crisp here). 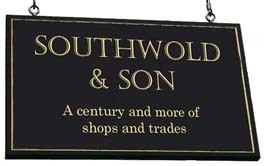 The previous landlord, Henry Garrod temporarily takes over the Crown's management. George Gage (K1896) To read an account of the life and career of George Gage by Jenny Hursell, click here. 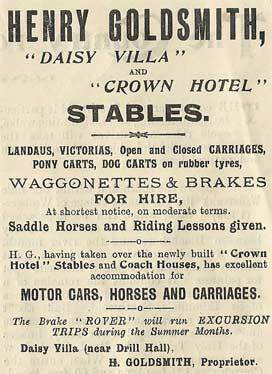 Sole Bay Hotels - (G) Was the Crown taken over by this company? Did it change its name? When did Adnams acquire it? The Crown in 1875. Southwold Museum P1020. 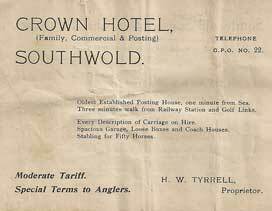 Reproduced from Southwold Sea Angling Society Handbook, courtesy of Carol Stone. 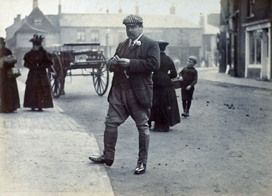 George Gage, Landlord of the Crown pictured in the High Street close to his hotel around the turn of the century. 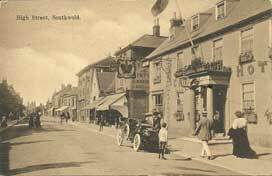 Crown Hotel in 1915. Reproduced from a postcard in the Robert Palmer collection. 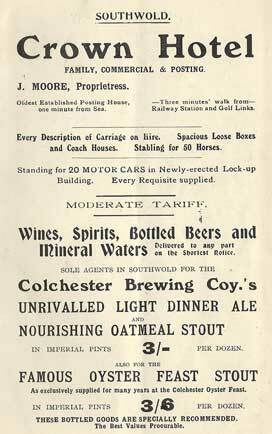 Advertisement in the Southwold Visitors List of 1907. 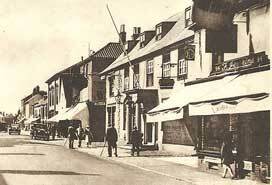 The Crown Hotel in 1930s (?) from a postcard in the Robert Palmer collection. 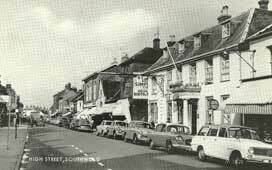 The Crown Hotel, probably in the 1960s. From a postcard in the Robert Palmer Collection.